After a brief break due to a long weekend we are back with a buzz... That seemed too easy.. 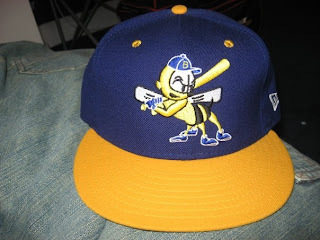 In any event, this is a throwback cap of the Burlington Bees. The Bees are a single A affiliate of the Oakland Athletics. This team, which may not have worldly acclaim, does have quite the history in its rear view mirror. The Burlington club has been a part of baseball since 1924, and a part of the Midwest League of Minor League Baseball since 1962. Prior to their current West Coast affiliation, the team has had a rap sheet of sorts as far as teams they've been in cahoots with. Their most recent extended relationship was with the Kansas City Royals from 2001-2010. The team plays their home games at 2712 Mt. Pleasant Street, at the 63 year old ball park known as Community Field. This old park seats a cozy crowd of 3,200 fans, and is said to have one of the most intimate atmospheres in all of small town baseball. Some of the most notable former Bees are Ruben Sierra, Vida Blue, Paul Molitor, Larry Walker, and Kenny Rogers . This cap featured, which keep in mind is an older logo, has a yellow brim, royal blue crown, with an insect of the arthropodic variety wielding a more than likely tooth pick sized bat. Kinda elementary, fun, and simple, but hey isn't that what minor league baseball is about? you can find the teams current cap at the link below. Enjoy and see ya tomorrow.